Loratadine—also known by its brand name, Claritin—belongs to a group of medications known as antihistamines. It reduces the effect of a natural chemical in the body called histamine; this chemical can cause an array of symptoms like runny nose, itchy eyes, sneezing, rashes and more. Claritin is considered safe for children, adults and the elderly and has very few side effects when compared with other sedative antihistamines such as Benadryl. Patients who are taking Loratadine should be on the lookout for unusual symptoms that could be an indication of serious side effects—some of which can be life threatening. Claritin is taken once a day in tablet, suspension or chewable tablet form. Patients should never exceed the recommended dosage on the packaging unless instructed to do so by a physician. Claritin is a brand name for the generic drug loratadine which is also available in other trade names and as a generic drug. It is available in different drug formulations and strengths: tablets (10 mg), syrup (1mg/ml), and rapidly-disintegrating tablets (10 mg). It is also available in combination with a decongestant – Claritin-D.
Children's Claritin - available as grape flavored chewables or syrup. Originally approved by the Food and Drug Administration in 1993, Claritin was made available without a prescription in 2002 and is currently manufactured and distributed by Schering-Plough HealthCare Products, Inc. Generic drug loratadine is manufactured by several companies. It is still available in a prescription formula for other uses. Although Claritin is generally thought to be a medication that is used to treat seasononal allergic rhinitis, “hay fever” and other allergies, it can also be used to treat runny nose and sneezing associated with the flu and the common cold. People who suffer from chronic urticaria, or hives, have also experienced relief as a result of their treatment with Loratadine. All of these conditions are caused by chemicals called histamines, and drugs like Loratadine are designed to reduce the effects of these chemicals and provide patients with relief from the symptoms they cause. It is not intended to treat or prevent serious allergic reactions or other types of allergies. Do not use this drug in place of other antihistamines your healthcare provider has prescribed you. It should not be used for children younger than 6 years unless prescribed by your healthcare provider. Claritin is classified as a second-generation antihistamine, also known as tricyclic antihistamine or histamine receptor antagonist. This class of drugs works by inhibiting the action of histamine which is responsible for symptoms of allergies. It competes with receptors of free histamine thereby providing temporary relief of negative effects due to this natural substance. Claritin is available in 4 forms. Each should be taken only as directed. Taking too much of this medication may cause increased side effects and could be fatal in extreme cases. You may be prescribed an immediate acting tablet, an extended release formula, a liquid syrup, or a dissolving tablet. If taking this drug over-the-counter to treat symptoms of allergy, be sure to read the product information label before taking each dose. If prescribed by your healthcare provider, carefully read the prescription label and take the drug exactly as directed. If you do not understand the prescription or have any questions, ask your healthcare provider. All forms of Claritin are typically taken by mouth, one time per day, and can be taken with or without food. If taking the regular tablet or capsule form, swallow the drug whole with a full glass of water. Do not break, chew or crush the pill. If taking the chewable tablets or oral-disintegrating tablet, allow the drug to dissolve well in mouth before swallowing. It is important to handle the disintegrating tablet as directed to prevent damage and to never chew or crush the extended release Claritin tablet. If using oral solution, use the measuring device (such as spoon or cup) that comes with the bottle. Each patient is given a different dose depending on the condition, age and response to treatment. Do not take more than recommended. If symptoms of allergy persist or worsen after 3 days of treatment, consult your healthcare provider. Do not take the drug if you have known allergy to its contents. Discuss with your healthcare provider if you have any other allergies. Do not self-treat with this medication if you have other underlying medical conditions such as kidney and liver impairment. 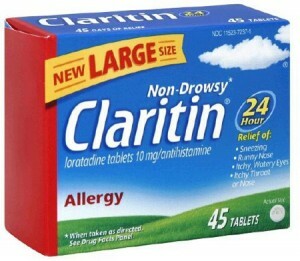 When taken at recommended doses, Claritin is not expected to cause drowsiness. However, driving, operating heavy equipment or performing activities that require focus and attention should be avoided, initially. Claritin chewable tablets may contain aspartame. Patients with phenylketonuria (PKU) or other metabolic conditions that require avoiding aspartame may not be able to safely take chewable tablets. Consult your healthcare provider before taking Claritin Reditab. Caution is advised when used by older adults. Children younger than 6 years should not take this drug, unless prescribed by a healthcare provider. A trade name of the generic drug fexofenadine, Allegra is an antihistamine that counteracts the actions of histamine in the body.